Jimmy Kimmel thinks conservatives are too dumb to be talk show hosts. “It just so happens that almost every talk show host is a liberal and that’s because it requires a level of intelligence,” the host of “Jimmy Kimmel Live” said at an event Saturday night. 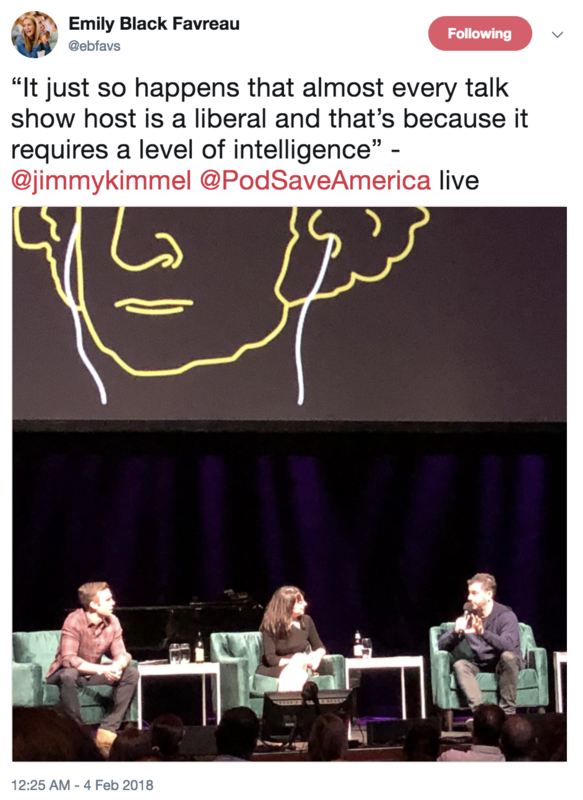 Kimmel made the comment at a live event for liberal podcast “Pod Save America.” Conservatives on Twitter immediately slammed Kimmel for the comments. Really? Because Kimmel's a host and is stupid enough to think political party is a proxy for intelligence. Saturday night wasn’t the first time that Kimmel has attacked conservatives. The liberal late night host previously used his show to rail against Republican health care legislation. Senate Minority Leader Chuck Schumer, it was later revealed, secretly fed Kimmel Democratic talking points to help him attack Republicans.